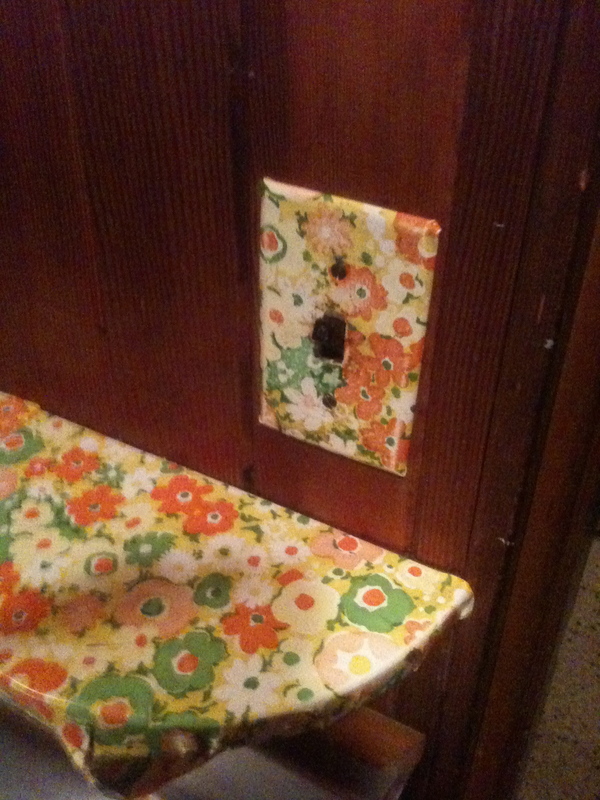 Tackiness at Hearst Castle is nothing new… here is some lovely 1960’s wall paper wrapping a switch plate cover in the “secret” kitchen… downstairs in one of the guesthouses, behind what looks like just a closet door. WRH probably didn’t see this modification… looks a bit more like the Patty Hearst”era to me. Maybe this is what inspired Lady Gaga in her most recent video filmed at the castle… we’ll never know I suppose. 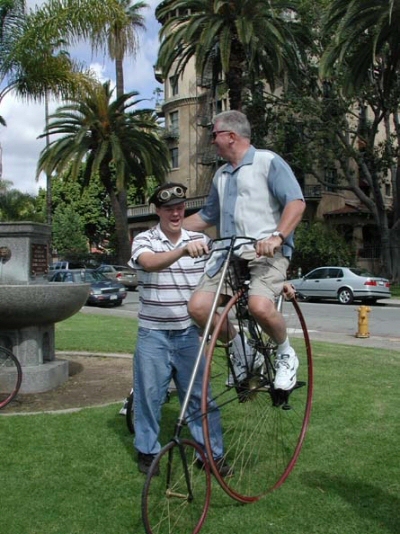 Huell Howser passed away earlier this month. His entire library of “California’s Gold” episodes are now online because he donated his complete film catalog to Chapman University. thanks to Copenhagenize for sending the link! Old three-striker at gopher holes. This is a really long post. You may want to get a cup of coffee first. You may actually not care at all… but it would have been my mom’s birthday a couple of days ago… So I thought I would write about her… and the concept of the word “cool”. In the early 1950’s, before I was born, my mom Lucy ran a store selling metaphysical books, art supplies, and jazz records. It was decorated in a Zen style which in those days meant a red door, tatami mats on the floor, paper Japanese lamps hanging from the ceiling, cast iron candle stick holders, and rattan window shades you pulled up with a cord. She usually walked or rode her bike to work… accompanied by her black standard French poodle…. Cobby. Sales were not huge. Mostly she just served coffee to her musician and artist friends, from a percolator no doubt, while they hung out and listened to Sarah Vaughan and Ahmad Jamal records and talked alternately about Buddhism, Hinduism, psychology or philosophy. She wore cable knit sweaters, corduroy pants, wool socks and workboots bought from Giannini’s fisherman’s supply shop down by the harbor. The neighbor lady’s Siamese cat “Salvador” was a fixture in the window. (Salvador was one of those old fashioned fat headed Siamese cats from before cat breeders chose for skinny noses) The coffee wasn’t espresso, it was just coffee, Maxwell House most likely. 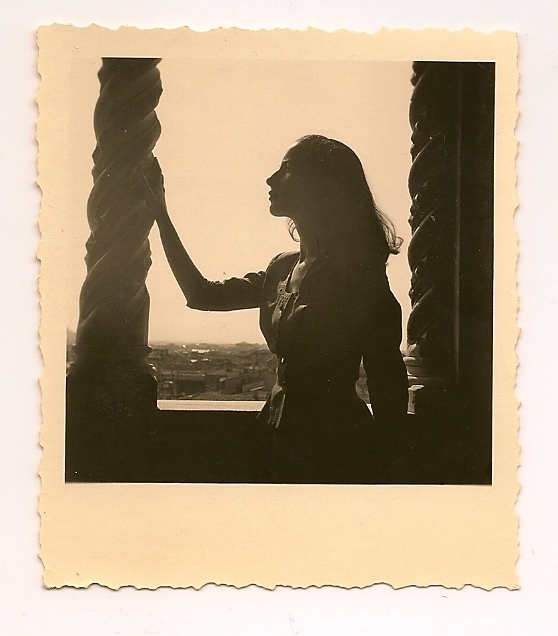 What I have left of this era are a cigar box of black and white photos shot with a wide angle lens by a grad student from Berkeley who’s name I have forgotten… of the characters that often inhabited my mom’s shop… and the stories. 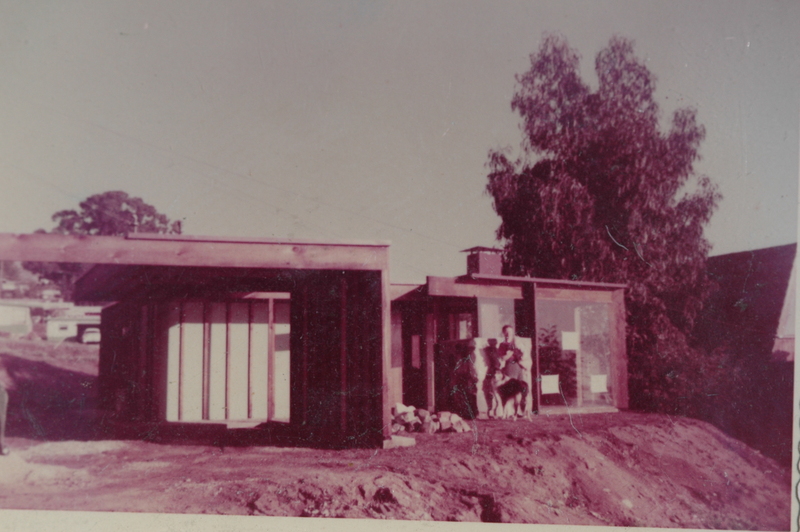 Margaret Meads ex-husband Gregory Bateson frequented the place. 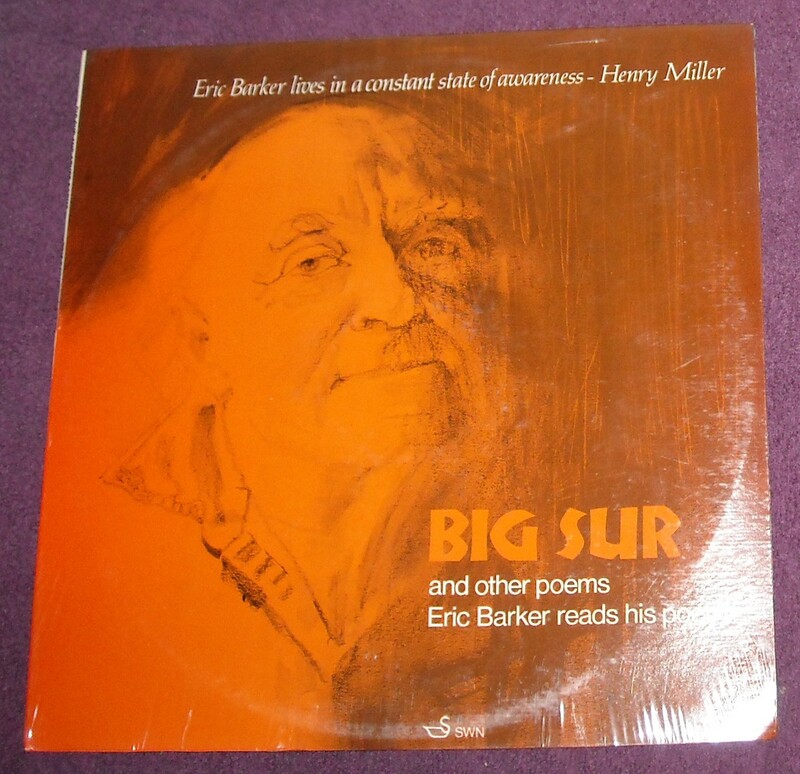 Most of the beats had been in… as well as my namesake… Eric Barker… the Big Sur poet who could be found hanging out with Henry Miller at the bar of that new restaurant called Nepenthe’s on the land Orson Wells used to own. Lucy also knew a fellow named Michael Murphy because they shared a common interest in moving to the Sri Aurobindo ashram “Auroville” just outside Pondicherry India. 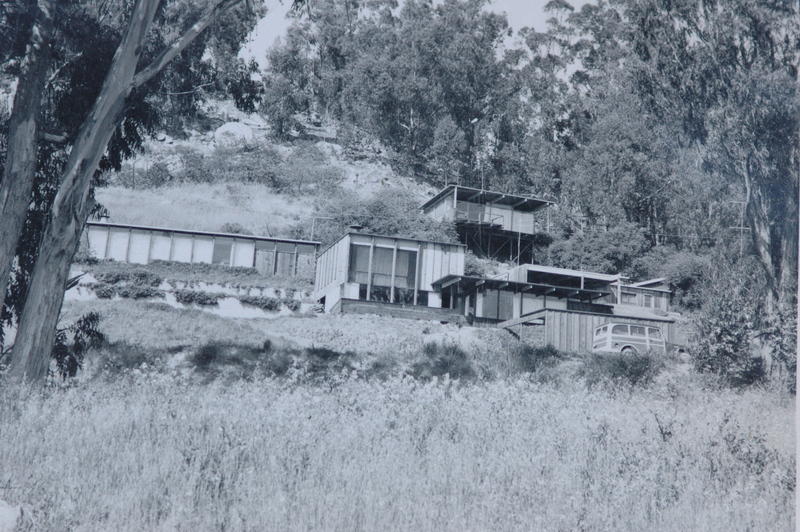 Murphy later moved there… and eventually founded Eselen in Big Sur. Lucy never moved to India… because my childhood doctor…BLESS HIS HEART! Dr. Ekegren or Dr. Tedone… one of the two…I can’t remember… told her she was an idiot to take me, a five year old, there. I did get a Cholera shot that day… which was the reason for our visit to the Dr…. in advance of leaving the USA and which is the only part of that day I remember clearly. Anyway… running a bookshop catering to pseudo beatnik artists seems like a pretty interesting thing to be doing in the early fifties from the rose colored hindsight of 60 years later. I’m sure she decided to open it after visiting Lawrence Ferlinghetti in San Francisco and falling in love with his City Lights bookshop there. The trouble was that she was in Morro Bay… then mostly Portuguese abalone divers and Swiss Italian dairy farmers. Eastern Philosophy meant nothing to them… they could care less about Alan Watts, or the latest music… and that damned standard Poodle was best known around town for the time he stole somebody’s entire laundry line and tugged it and the clothes on it down Morro Bay Blvd. Within a year or so the shop closed. Prior to the bookstore Lucy had lived in LA and worked for the Capital Records PR Department writing copy for many of the 1940’s jazz greats. Earlier she had lived in London, Rome, and Madrid. Her husband was a writer and reporter for the United Press who’s job it was to cover the Consular Core abroad. He wrote and she bought a few modern paintings. She drove a jeep. She wore scarves. She was tan. WWII was a side note. 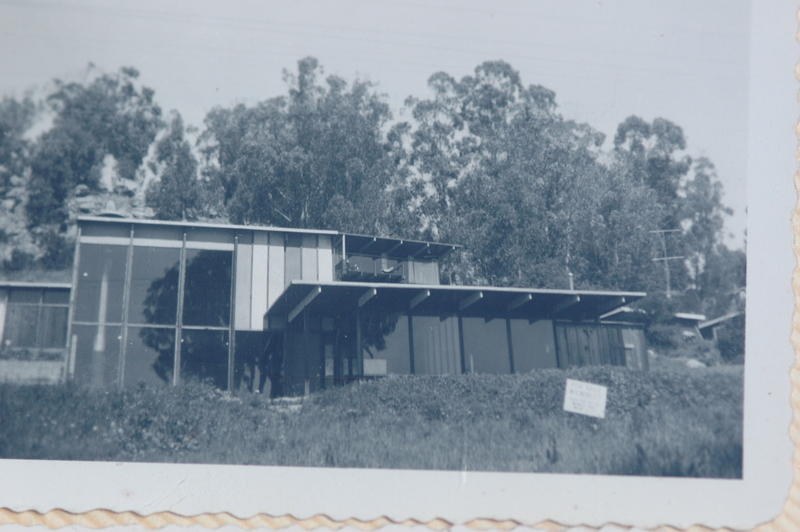 On vacation to Morro Bay one weekend they noticed a for sale sign on an ocean view redwood and glass house. They stopped to have a look and a man was standing there with a large hammer in his hand laughing. “What’s so funny?” Lucy asked. “Well”, he said,” I just finished pounding in that for sale sign about 20 seconds ago”. Within a year the marriage would be over. But that house would be Lucy’s home for the next 50 years… and Gerry, it’s architect, the laughing man with the hammer… would later become my father. 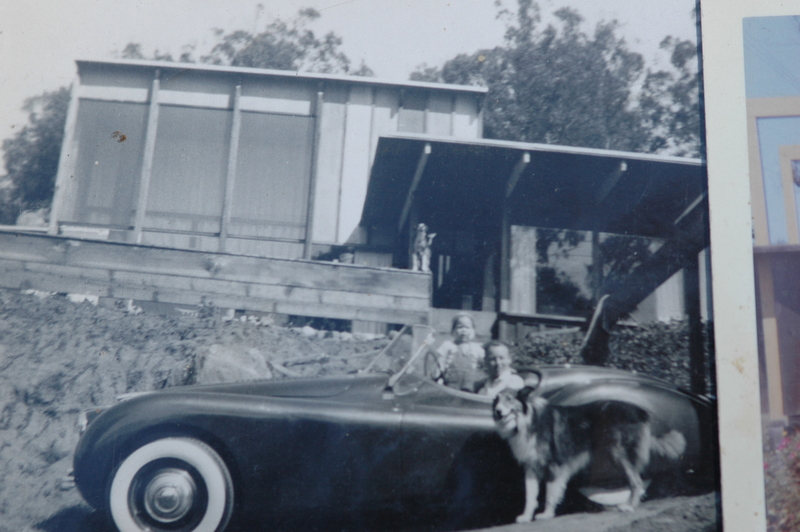 Richard Neutra and Rudolph Schindler had pioneered the modern “international style” of architecture in California 20 years earlier… but a modern house was still an unusual sight in 1954… and Lucy’s house really stood out. Gerry Rupp was a mostly unknown modernist architect who alternately drove a Jeepster, a 40’s Chrysler convertible or an early 1950’s VW single cab pickup. He called the VW “the old Nazi” and purposefully beat the hell out of it… as payback for his WWII war injuries I suspect). 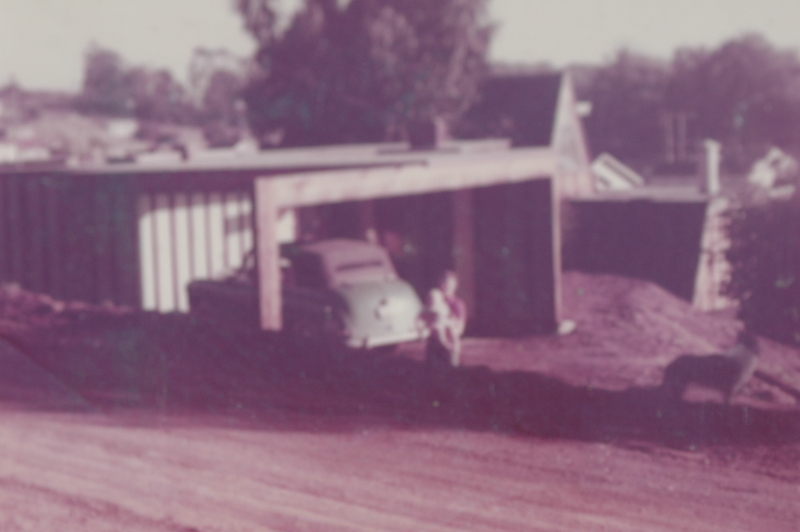 This truck was later sold to another neighbor… and I was brought home from the hospital in it. 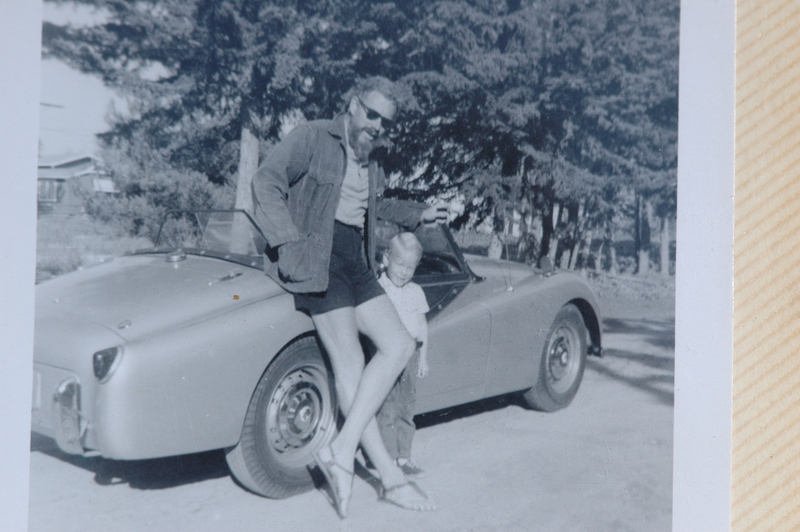 He wore leather sandals… corduroy shorts… and had a beard. He had several medals from the war. He had studied law… semantics in particular. He lived in an A- frame he built in 1949. This was the first modern A-frame. 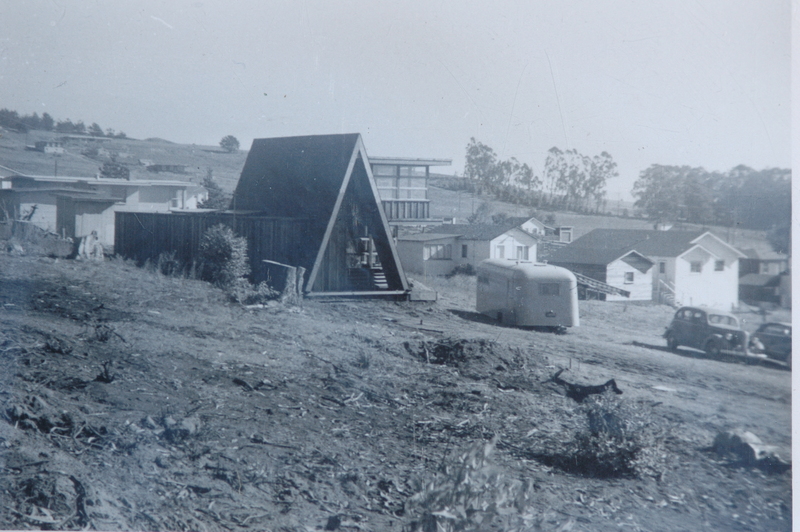 Another architect Gerry knew, Mark Mills, built an A-frame home in Carmel by the Sea few years later. 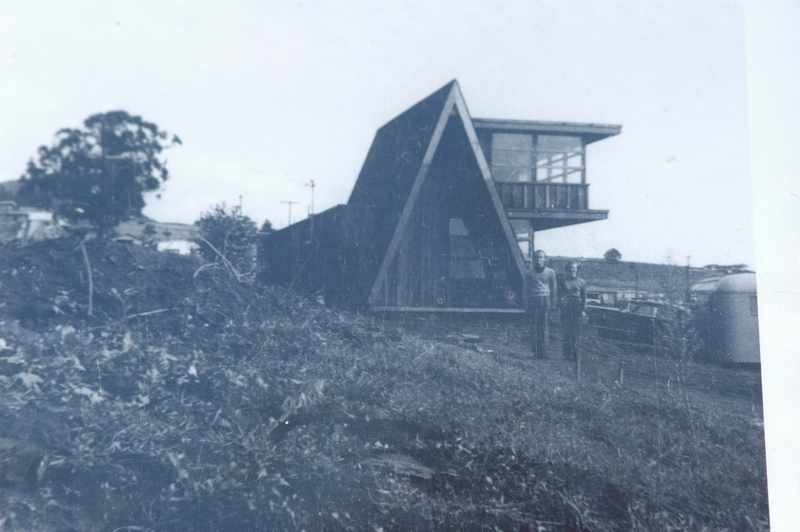 A few years after that Nathanial Owings (of Skidmore, Owings and Merrill architects) would copy Mark Mill’s A-frame design when he built his (now famous) “Wild Bird” house on the coast of Big Sur in 1958. 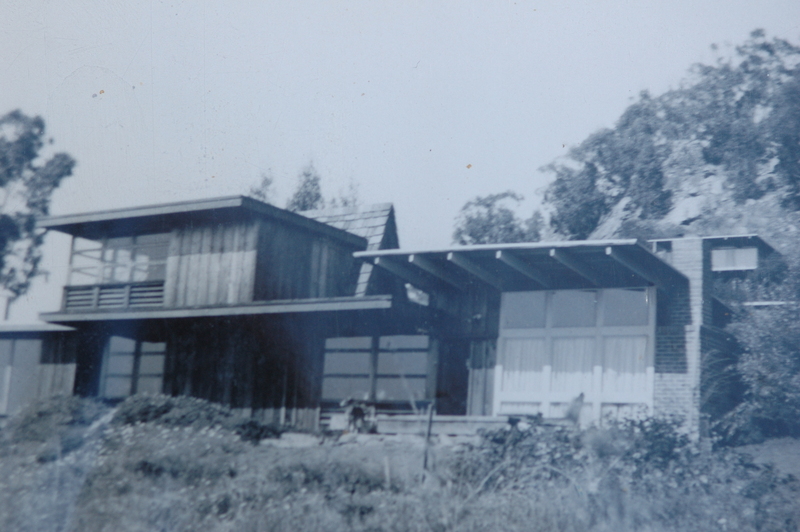 Andrew Geller on the east coast would get credit for inventing the A-frame style due to his 1955 house on the east coast. I showed photos and wrote about this in an earlier post. Back on subject… and to put all this in context… when my mom was a kid… in the 1920’s… The graphic designer Alexander Rodchenko was founding the Russian Avante Garde, Walter Gropius was building the Bauhaus in Germany, the surrealist painters had published the first issue of La Revolution Surrealiste, there was New Orleans jazz music on the new “radio” and Ford was selling two million Model T’s per year. I think it’s important, the context that is, because I am fairly sure that my mom was one of the first people that were truly “cool”. In the 1950’s it was probably stupid to ride a bike to work to everyone except the core beat generation types… who considered it cool to be down and out. Somehow… the idea of being modern… and progressive… included being down and out… and my mom owning that (money losing) store… and riding her bike because her Renault sedan(still pronounced “rehnahlt” then here in the USA) was broken… all of this was good somehow. Bad was good. Add to that her history in Europe… the job writing copy for the jazz greats… well it just adds up. She was cool. And I mean this in the fifties Beat sense of the word… like when somebody said… “he’s cool”. Well it acknowledged that not only did this “cool” person get the whole concept of modernism… he also was just as happy to have rejected anything mainstream and was a more accepting individual. He was not likely to judge others for being avant garde or unusual in some way… more likely he would judge you if you were too normal. The cool person was an insider… he knew the score… he wasn’t gonna call you out for whatever you had to hide. Its really a fantastic evolution… from “calm and collected”, the previous definition. My grandpa, born in the 1800’s, was of a different era altogether. He was a telegraph operator in Indiana. He lived a few miles from the train station on a small farm and he rode a bicycle to work. During the great depression he often gave his lunch to the hobos and did without. He was a respected member of several Fraternal Orders. He went to church. He remembered when they first got electricity. He did not own a car. Nobody he knew owned a car. He was a good man. But grandpa was not cool. Somewhere between my mom and my grandpa… cool happened. My first personal experience with the concept of cool came with the gift of a bike. (the more savvy among you will now notice the secondary bike theme) It had been my mom’s bike in the 50’s. A pre war skip tooth Roadmaster … she and I painted it purple with a spraycan. (Hey… it was 1970!). It was “a stupid girls model” (said with the disgusted inflection of an 8 year old boy). It also weighed about 40 lbs. The other neighborhood boys all had new banana seat bikes usually called Stingrays. They had a club called “Heaven’s Devils”… comprised of only banana seat bike owners. I was not admitted to this club… as mine was not a banana seat bike….on top of this… mine was a girls model… horror of all horrors. So evenings at my house were spent staring at the Sears catalog, or Boys Life… reading all that was then available to an 8 year old regarding bicycles. The social pain associated with having an older model girls bike was quietly absorbed by me… as my mom was always poor as a churchmouse. Mostly I knew this because I always had Sears Toughskins… and the other kids had Levi’s. To my great surprise… the next Christmas Santa blessed me with a green “Free Spirit” model Banana seat bike(with a sissy bar even!). Not quite as good as the “orange peeler” Schwinn that the neighbor kid had… nor nearly as expensive… but it did allow me admittance to the club… which by now had basically disbanded anyway. In any case… I was no longer the dork on the old girls bike. But the cool that I was… upon reflection…(and I have given this a great deal of thought) well it differed from the cool of my mom… whom at that time I didn’t realize was cool. My cool was a marketed form of cool… primarily driven by advertising. The boys in the neighborhood saw the newest items in various magazines… and the richer of these boys got them first. Slingshots for instance… I had one… most kids did. But Billy Warner got a “Wrist Rocket” model slingshot one day… and within the hour all other slingshots were not cool anymore. Same goes for skateboards… I had a “Black Knight” from Thrifty Drug store… as did most of the kids in the neighborhood… yet when Jimmy Warner (Billy’s brother) got that first Hobie… well it was advertised in various magazines… and all the cool kids in the magazines had them… and suddenly the “Black Knight” seemed pretty uncool… and I basically felt second tier suddenly… when the day before I had been just fine. So this Beat notion of “cool” was co-opted by advertising agencies to mean newer and better somewhere in the sixties. Sure… the idea of new is better had been around for a while.. but this addition of cool factor really ramped things up and suddenly people everywhere were not as cool as they could be. We as a society weren’t prepared for this status upgrade assault… and worst of all we fell for it hook line and sinker. Last year’s style was uncool… the new version was much cooler. The Beat meaning still stuck in certain cases but there was now this other marketing driven version of cool that had a status associated with it… and that status association was COMPLETELY different to the status associated with the beat generation meaning of cool. It was in fact almost the exact opposite. Nobody seemed to notice this insidious evolution but it has made a great impact on our culture. Here was this other iteration of cool… more rightly now called “trendy” I suppose… and it has driven marketing ever since. The cool (trendy) guy gets the girl because he has the cool (trendy) car… the cool (trendy) girl gets the guy because she has the cool (trendy) clothing from the cool (trendy) clothing brand… the cool (trendy) kid has the cool (trendy) bike… the cool (trendy) mom buys the latest cool (trendy) snack… blah blah blah. Television and marketing now tell us what is cool. It is very difficult to ascertain the truly cool anymore. Is Lady Gaga actually cool… or is she only cool because her PR machine and her carefully marketed cynical attitude have fooled everyone into believing that she is making fun of things that are marketed… and therefore she is cool. This is a devious and brilliant reverse marketing concept. I truly don’t know whether she is actually beat cool… or whether she is just marketing cool. Truly beat cool has a sort of cyclical relationship with marketed cool. At first a beat cool theme is adopted by a prime mover, an alpha… Someone actually does something cool, or wears something odd cool, or uses something in a new cool way. This might be a musician or a famous personality. Whatever. Next it moves to the beta’s… the group closest related to the prime mover. Next people all over, usually young people, begin to adopt this theme or behavior. Then that cool thing or theme is quickly glommed onto by marketers and advertisers… using this new cool thing to catapult their agenda or product to a larger audience thus making them cooler than their competition. Once the theme or product hits a certain saturation… the core group of users starts to reject the cool thing… the cycle ends. Coco Chanel famously said, “fashions fade, only style remains the same”. This is the difference between beat cool and trendy cool. Thus the truly beat cool… are usually perceived as uncool by most folks at first. Once understood… this is pretty funny. There is an entire industry of trend forecasters that make a living prognosticating what is cool to corporations. Their jobs are to watch for these odd new often uncool looking behaviors… and to then carefully track them to see if they lead to a trend. It is interesting to note that the entire modern notion of “cool” really only goes back to about 1920. My grandpa in 1910 had no notion of being cool other than it meaning “calm and collected”. I suppose that there was a concept of fashionable… or classy… or of character. But there was no separate “cool factor” that transcended things. A person was simply classy… or fashionable. They were not “cool” yet. So move forward to roughly the 1920’s… to those modernist movements… the Russian Avant Garde… also called “Constructivism”, De Stijl in Holland, Bauhaus in Germany, Modernistas in Spain etc etc… All of these were design movements by intellectuals trying to advance quality of life for a wider variety of people…. To make things more than they had been prior to the industrial revolution. To bring quality to the average man. It was a time of great changes in art, literature, music and design of all types. All the norms were being challenged. Those people that challenged the norms were different than those that stayed within the old paradigm. They were modern. They were avant garde. They were often outcasts and considered rebellious. This also defined both the beat generation that was to come… as well as products and corporations that embraced the most modern concepts. The concept of modernism separated those that accepted it from those who did not. There came to be cool people… and then everyone else… although I am not exactly certain when cool happened. In reality we got two different types of cool… and while they should be separate entities… they are not. These two cools are not at all the same. The term “cool “ doesn’t really allow for a distinction between the two. But the two have wildly different meanings and it is important to see the distinction. As you may have noticed… I call one “beat” cool… and the other “marketed” cool. But how can this be? Surely not everyone is cool. This defies the concept of cool. Some of these people must be uncool. But who then is the arbiter of cool? The 80 year olds listened to Elvis… they knew Rock and Roll… they built hot rods… some were beatniks. The 65 year olds knew the british music invasion… they were hippies… they took acid… they smoked pot. Anyone under 50… well hell… they were raised under an aura of marketed cool. Cool is ubiquitous to them. Are they all cool? Something funny happened to cool around 1990 or so. Cynicism began to be hip. First it was just a small group.… self made pundits analyzed and criticized everything cool… such that things which were not formerly cool became cool simply because they were uncool. Reverse Marketing was born where brands made fun of themselves in order to look cooler. This was not totally new… Doyle Dane and Bernbach Advertising (DDB) had done this in the 60’s with VW’s advertising. But in the nineties it took on a whole new dimension… a truly negative cynical twist. I was making shoes then… the brand I built was called Simple Shoes. I had a hunch about clogs because I saw them on the feet of a couple of people I knew who hated everything cool. They were purposely trying to be uncool by wearing clogs. So… I went deep and started making clogs in a big way…on the hunch that these uncool cynics were actually the next wave of alphas… and that soon everyone would want to look uncool. We advertised them in that DDB style… as “the ugliest shoes that you could buy”. We told our customers to “hurry and buy them before they become trendy”. At first the shop owners looked at me like I was a complete idiot. “there is no way in hell I am gonna sell any of these… get them ugly things out of my shop” Steve Carlson told me at his shop “Central Coast Surfboards”. I did get Steve to test them however… and they sold out to his most forward customers within a few weeks. The next time I saw Steve… he was wearing my clogs. It was not cool to look too cool. But it was cool to look a bit uncool. Very confusing. Something troubled me about this. I was simultaneously making a living by marketing consumer products by making foreward thinking people think they were cool… and growing tired of marketed products and consumerism myself. This was an odd spot to be in. It started to feel really stupid and dishonest for me to continue to convince people that they needed my brand over some other shoe. In reality… I knew it shouldn’t matter what kind of shoe a person wears. So I decided to sell the company… as it really wasn’t cool to be selling cool. Of late there is an even further evolution in cool… I’m still not quite certain what to make of it. A new era of critic has been born. Critics of the extreme forward niche. The Blog “BikeSnobNYC” is a perfect example of this. (note bike theme under-current example again… I’m a bike bike enthusiast… and will promote cycling however possible! There can be no shame in that.) . BikeSnob makes fun of the leading edge of bike culture before anyone else does. This blog is truly funny. Something can barely peak its head out of the new idea box… and Bikesnob will find a way to make fun of it. This has made BikeSnob really cool somehow… even cooler than the coolest new things to hit the scene. Somehow… belittling the most interesting new progressive ideas makes the the most fervent of bike geeks want something even newer still. It is ridiculous… and funny. There are larger bike trends… ie The 1970s “bike boom” when ten speeds flooded the market, BMX, Mountain bikes, fixies… etc etc. Well amongst the bike cognescenti there are some fairly micro niches that most folks don’t know about or understand.… like the retro French randonneuring tweed ride (betcha never heard of that one), Dutch cargo bikes, nervex lug collecting, NOS Campagnolo in the box collecting etc etc. Bike Snob has called out the Cargo Bike trend by calling them “smug bikes”. Mind you… that there are probably less than a few thousand Cargo bikes in the USA… and their owners tend to be the alpha amongst alphas of green consumers. These cargo bikes are primarily bought because the owners of these rides are using them as a form of protest against the automobile… in order to show others that you do not need to use an automobile for most tasks. BikeSnob is making fun of a group that most people don’t even know exists yet by calling them smug… which they are… but they’re still a radically forward thinking bunch that will eventually impact the balance of society… but by calling them smug years before they even have an impact… well… it is just funny…. And it somehow makes BikeSnob truly cool. The last word is that cool isn’t really one thing… it is hugely multifaceted. And just because something is cool… doesn’t mean you should like it I guess. You need to research it… and why it is cool… and whether this cool thing is really cool or not is up for you to decide. You shouldn’t let our “advertising and branding culture” define what is cool. More than likely it is only cool because a lot of money is being spent to fool you. My mom was cool. I miss her. It would have been her 91st birthday today. Little known Secret of Mission San Luis Obispo… a Jacuzzi ! So… I was standing on the pedals of my bike while on the sidewalk… leaning against the back wall of the Mission San Luis Obispo… waiting for my botany professor buddy Matt Ritter…to take a picture of a street tree for his new book about the trees of California… and this extra few inches of height offered me a view of something I doubt I ever would have known about otherwise. I was able to look over the 6′ 6″ wall toward the the exit door behind the Pulpit… and next to where the nuns live… and what do I see???? A Jacuzzi! That’s it there with the Turquoise cover on it! Hmmm. Hot Tubs aren’t what I normally associate with the Church. Actually though… I think I like the church better now! 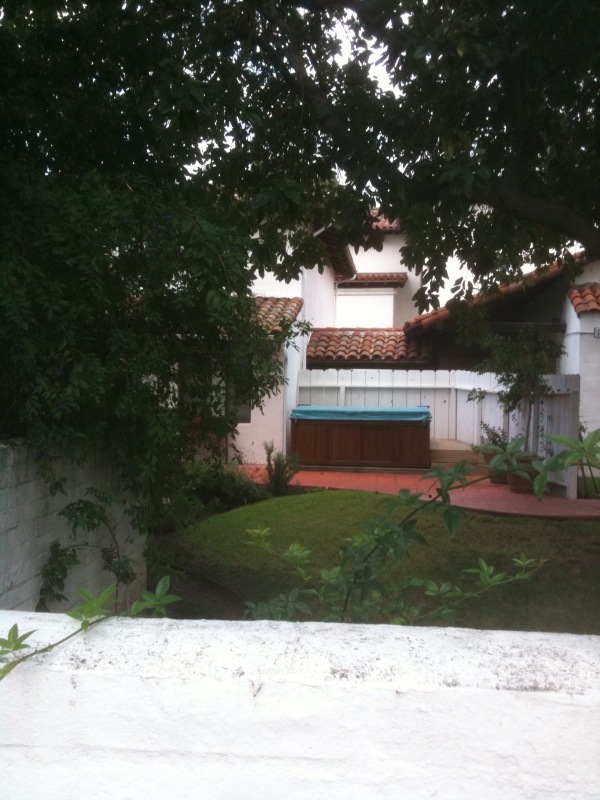 Below is better view of the wall I was peaking over… on Palm St. just west of Chorro. Here’s an interesting view of the intersection of US highway 1… and Los Osos Valley road. Circa 1972. Check out how wide San Luis Creek is in this shot! Parts of Dalidio’s farm are covered on the left of the freeway… and the right hand side of the highway… where the sewer treatment plant is… well that’s basically underwater! The creek is more of a RIVER. If you click on the photo… it will get bigger… there’s more to see when it’s bigger. 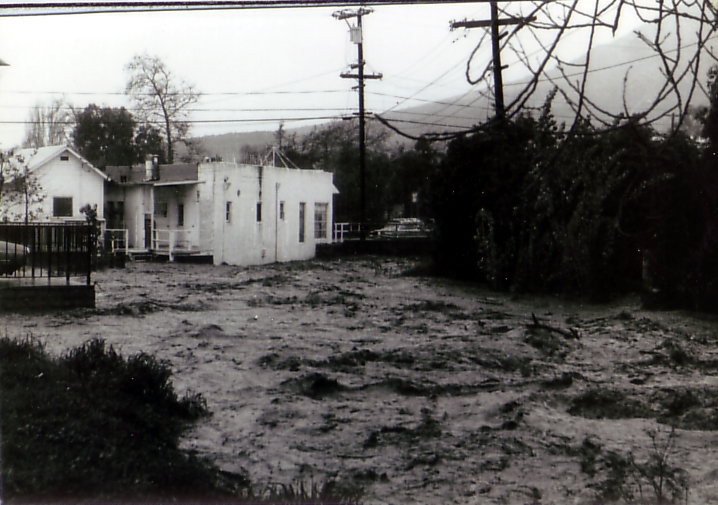 and this shot above… well that is san luis creek… you are looking southwest… towards Nipomo st. from mid block… behind the buildings on Higuera where the creekwalk is now. 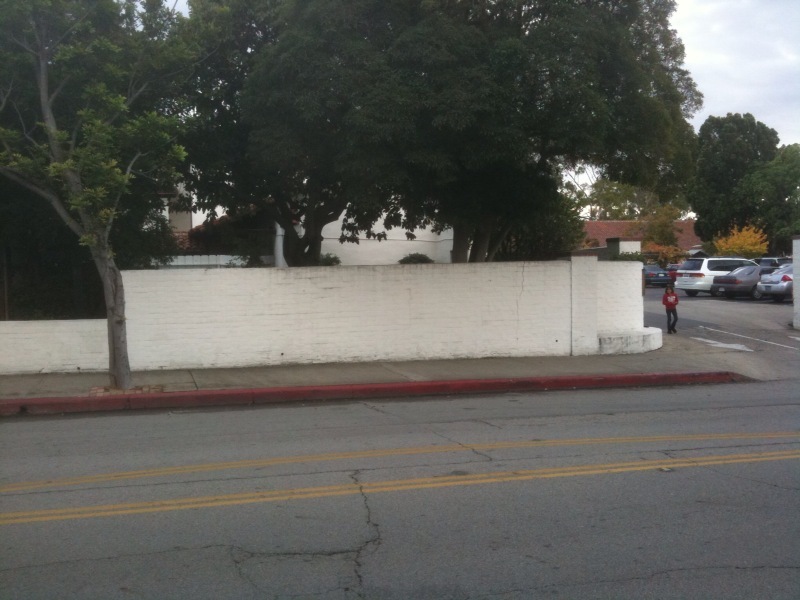 Today that white building in the foreground is “the Burrito wagon” I think… you are looking at the back side of it and Nipomo st. is out front….you can see the railing on the bridge…. the Children’s Museum would be in the upper right of the shot in a photo taken today… behind those bushes and rightmost telephone pole sorta. 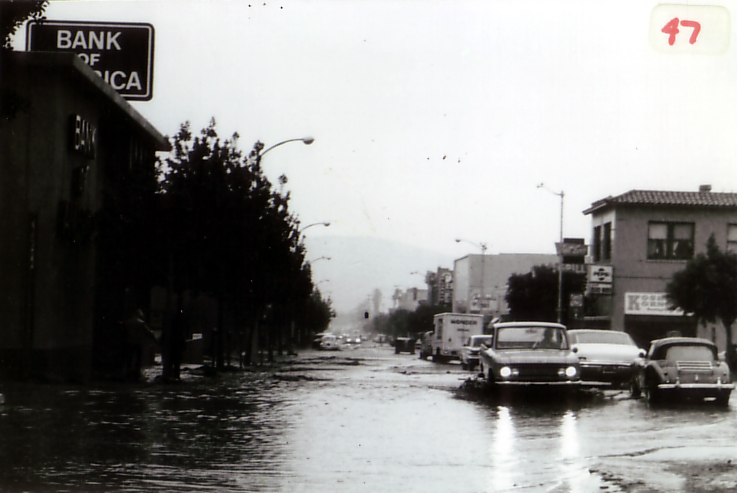 This is a shot of Higuera st. taken from near the corner of Higuera and Osos. Looking down Higuera. The B of A on the left is now First Bank. What happened here… is that the creek overwhelmed the tunnel under the downtown… and started spewing out from behind the Firestone Building (now Firestone Grill). So this water then travelled west down to Osos… and splashed up against the B of A… and then made it’s way down Higuera… through the middle of town. This shot above is Marsh st. 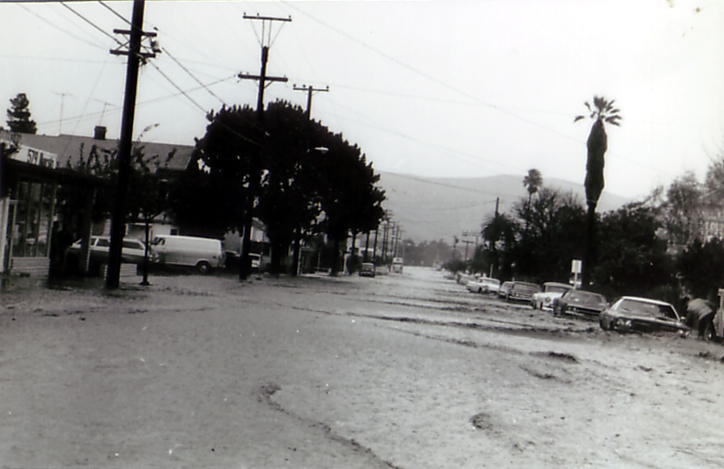 I am pretty sure this shot is from Nipomo st… looking west. Directly to the right of where this shot was taken is the Foster’s Freeze. Hazels Pet Shop would be on the left…. except they are out of business now. A different view taken from the intersection of Higuera and Osos… looking south on Osos. 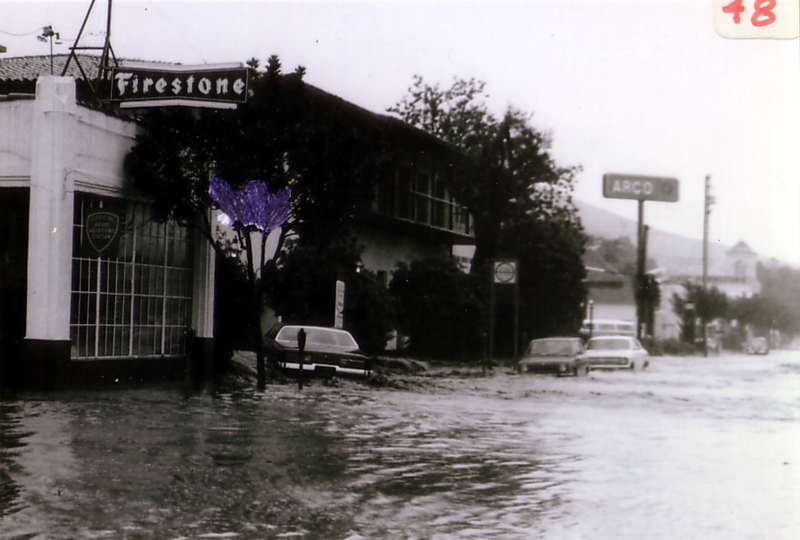 Firestone building on left… Arco in the background is now a big two story bank building on the corner of Marsh and Osos. New Times is now in the basement of the Maino building on the left behind the Firestone Grill. Wouldn’t want to be down there in this shot… totally flooded to the ceiling I imagine. This shot above is Monterey st… between Johnson and Toro… looking west towards the Fremont Theatre. 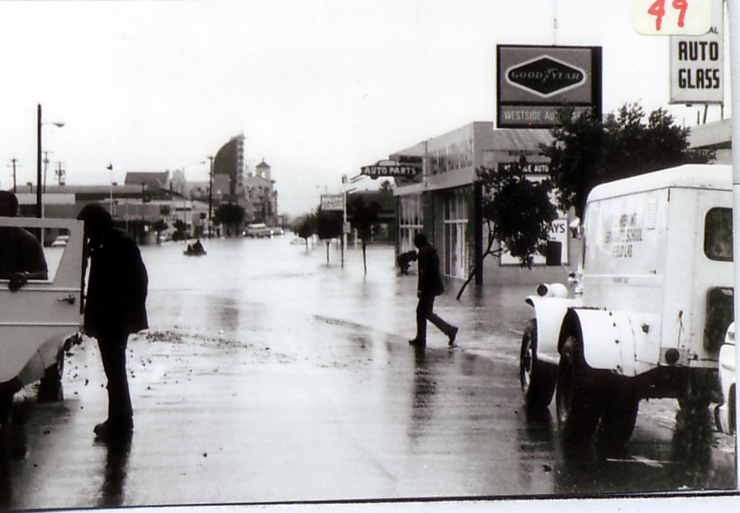 Westside Auto on the right… Currently Smith Volvo is on the left here… Notice the raft in the water! 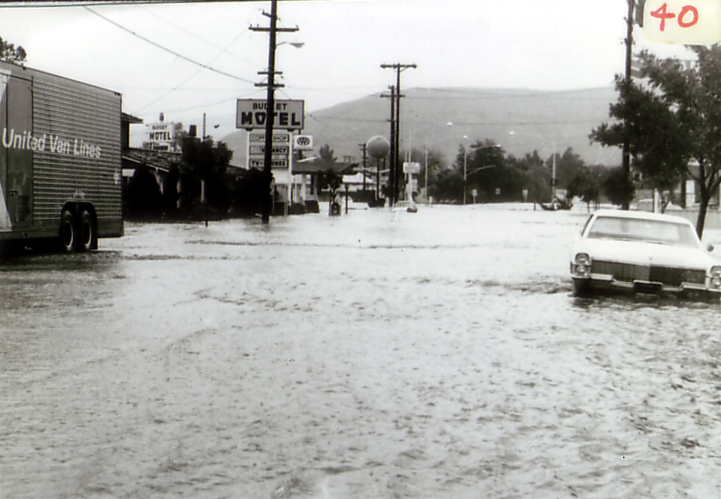 This shot above is on Marsh st. near where the Napa Auto Parts store is… roughly Beach st. I guess. Looking west. Budget motel down there on the left. It was a few feet deep down there on mid Higuera. You couldn’t really get down there. 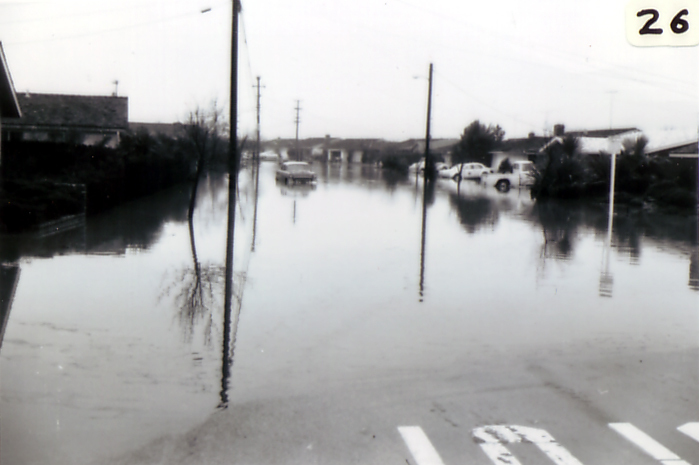 pretty sure this shot is of Oceanaire… just off Madonna Rd. Looking northwest on Oceanaire… just west of Laguna Lake… not positive about this location though. These shots offer a rare look at a view of San Luis Obispo most folks have never seen. The Public Works Dept has done an ENORMOUS amount of flood control work since 1972… to help alleviate situations like this. This is part of the “your tax dollars at work” that nobody ever sees. Dave Romero was running Public works in this era I think… Yesterday was his last day as Mayor. Thank you Dave… for all your years of service to SLO. UPDATE… Jan 2012… I’ve discovered that Rudolph Schindler built an A frame house in 1936… So this post is somewhat misleading. Sorry about that. Needless to say… Schindler is probably my favorite architect in the world anyway… here is the post from a year ago below. Click the link just above to see Schindler’s aframe. The other side of the A-frame… below… all in all there were 8 neighboring modern houses… and a few a couple more lots away… 10 all together. Gerald sold them to artists, writers, musicians… all early modernists. It was a hotbed of intellectualism and Beat Culture in the 1950’s. 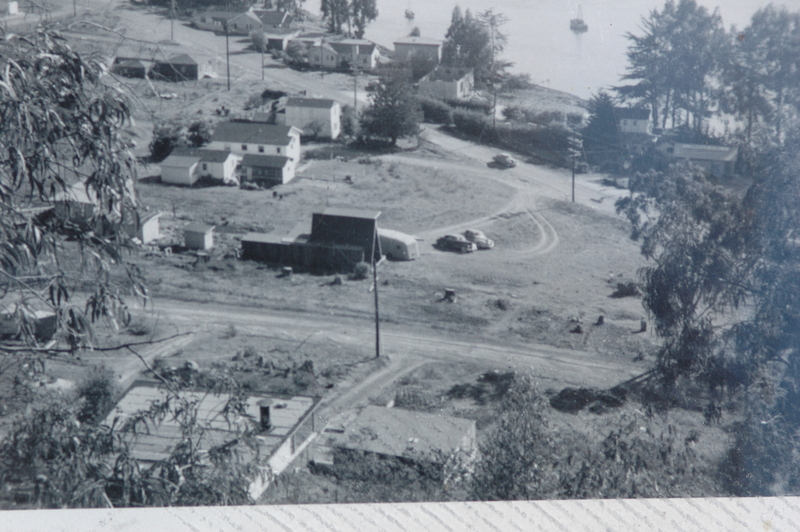 Known then by the local fishermen as “Beatnik Hill”. One of the first experiments in building intentional community between like minded individuals. Many Famous beat generation icons stopped through on their way to Big Sur.